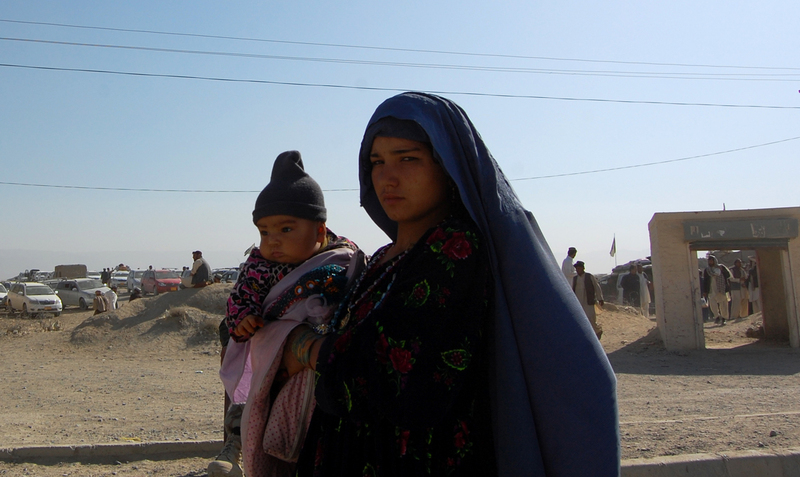 Afghan refugee women Bibi Rakema carry her daughter towards with his father to cross the Friendship gate on Pak-Afghan border Chaman, going to Afghanistan from Pakistan on Tuesday 06 January 2015. Photo by Matiullah Achakzai. Multan: For a woman, to become the president of Tehsil (town) Bar Association in Rajanpur is not a small thing. Shazia Abid had to fight on many front before she could claim this prestigious slot on January 10, 2015. A district that promotes conservatism and is rife with social taboos regarding women, coming out in flying colours against her male opponent with a margin of 30 votes (Shazia obtained 104 votes while her opponent Nadeem Rashid got 74 votes) shows that women are here to lead from the front. “We decided to field Shazia as our candidate for President Tehsil Bar Association Jampur with a view to change the mindset about women and to prove it wrong that women are inferior to men. Women play an important role in bringing up a prosperous and healthy society,” a lawyer, Ameer Bakhsh Khan Mastoi, one of the group leaders who supported Shazia as their candidate, told News Lens Pakistan. He said that gone are the days when women were isolated. Today people want their children to get education without gender discrimination. Coming from a lower middle class family, Shazia started taking part in politics when she was studying law as an LLB student at Gilani Law College of Bahauddin Zikariya University Multan. “I have no political family background; however, Benazir Bhutto has been my inspiration. I contested my first election for the seat of woman councillor from Union Council Gharbi Jampur in 2005. I won the election obtaining highest votes,” Shazia told News Lens Pakistan. Later, she also contested elections of District Council and eventually became the member of District Assembly. In 2012 when a PPP MPA, on a reserved seat, Amna Buttar, was disqualified Shazia replaced her and remained the member of the Punjab Assembly for five months till completion of the assembly’s tenure. “Benazir Bhutto enlisted me for the reserved women seats in the Punjab Assembly,” she added. While talking about the reasons for the backwardness of her district, she blamed the feudal lords for the injustice. These big lords, Shazia lamented, are against any development. “They do not want literacy, leave alone girls’ literacy rate to increase in the region. These feudals are scared that if the people here got educated they would challenge the system that has usurped their rights,” said Shazia. However, she believed that had the government been determined to develop the region, no power on earth could have stopped the region from gaining its rightful place. The government, she said, has been the main discriminator. Without schools, hospitals, roads, clean drinking water, Rajanpur is bound to remain conservative, underdeveloped and backward. With no employment opportunities, most of the people leave for Lahore or Karachi to earn their living. Women like Shazia are an example that showing courage and determination can go a long way in providing for the needed motivation to move ahead even if the entire is pitted against one. Rajanpur is not the only region in Pakistan that has dismal education condition; the entire country is engulfed in this deplorable situation. According to the Article 25-A of the Constitution of Pakistan, it is the responsibility of the state to provide free and compulsory education to every child between the ages of 5 and 16. However, when we look at the scorecard compiled in Alif Ailaan’s Pakistan District Education Ranking, 2014, we find 25 million children out of school in Pakistan, which makes nearly half of all the children in Pakistan. Those who are lucky enough to receive education are given the worst education quality. Similarly, 48 percent of government schools lack facilities such as furniture, bathrooms, boundary wall, electricity and running water. On any given day, almost 18 percent teachers are absent from the workplace. Even today, corporal punishment is used as a common tool to reform children in schools. In Rajanpur, higher secondary enrollment rate for both girls and boys is 9 percent, while the overall literacy rate is 34 percent. In spite of such a gloomy picture, the government has been non-serious towards ameliorating glitches in education sector in Rajanpur. In July last year, the Literacy and Non-Formal Basic Education Department, Punjab, announced a special literacy program to target more than 5,000 adult and children in Rajanpur and Dera Ghazi Khan Districts. The project was named Mera Ghar Mera School (My home, my school). When contacted by this scribe, the District Executive Education Officer Rajanpur, Abdul Ghaffar Langah, showed complete ignorance about the project and said he did not know if any such project has been launched in the district. The District Coordinator Rajanpur for Punjab Accelerated Functional Literacy Project, Ehtashamul Hassan, said that no such project was launched in Rajanpur and Dera Ghazi Khan Districts. However, there is a hope in people like Shazia, who are motivated to revive the almost dead academic and social system of Rajanpur. Shazia is hopeful and determined to defeat the forces of darkness. “We will change our fate by educating our children, particularly our girls,” she concluded.